This year the drumstick is 60 years old. Looking back it was very much a part of my childhood and it’s certainly part of J’s growing up years. It’s a tasty treat even now in my adult years and I have always loved the cheerful, distinctive yellow and red packaging. We’ve teamed up with Swizzels to help Drumstick tick things off the Drumstick Bucket List. 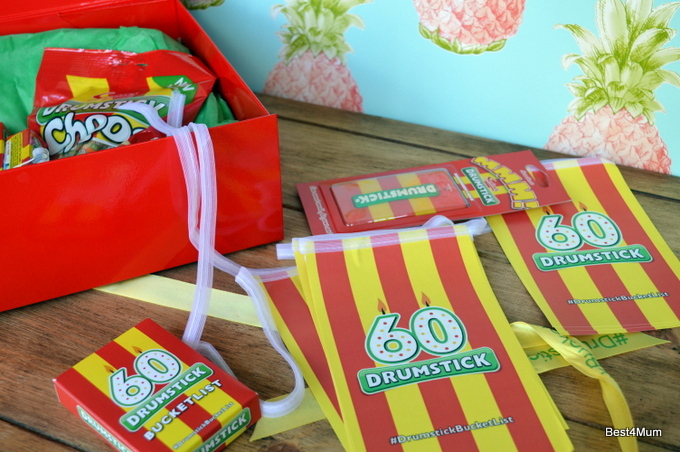 To celebrate Drumstick’s landmark birthday, they’re asking the nation to help complete an activity from the bucket list. All that is required is evidence of a Drumstick completing the activity. There are 60 items on the list so there’s plenty to choose from. All you need to do is take a picture or a video of yourself completing the bucket list challenge with your trusty drumstick. Upload your picture to the site to stand a chance of winning a great bucket list experience of your own. You have until 31st October to take part.